Hammocks, I have spent months of my life sleeping in them. This is an older post which I have freshened up with lots of hammock related links for readers who ‘came in late’. A quilt is more convenient than a sleeping bag for getting in and out. You can easily make one out of a sleeping bag – just leave the zip done up a little at the bottom to create a foot box. A (fixed) or adjustable centre line (now patented by Tom Hennessy, though a feature which many folks used for a long time before that) tying one end of the hammock to the other does add to comfort and give one something to hang things on (glasses, water bottles ditty bags, etc). Tom’s hammocks are wonderfully comfy and cosy (so long as claustrophobia is not a problem for you), and certainly keep insects out. It is a little difficult for me to get onto a mat in one, but Della has no trouble. I would recommend the Ultralite Backpackers (http://hennessyhammock.com/catalog/#hammock) though he used to make a lighter one named the ‘Hyperlite’ which Della has. The tarp really is adequate to keep the rain off, but make sure it is securely pegged down and taut. We have sewn a couple of short ‘wings’ on it since Joe first made it using about a metre of .5 oz/yd2 cuben so that we can close it up a bit more – as shown) if the weather turns a bit. It makes an excellent shelter – and you can have a fire out the front, something which is much more uncertain when hammock camping. Hennessy (and others) use these webbing tree protectors instead of tying straight to the tree. I suppose in areas where the same trees are used again and again this might make sense, but otherwise using spectra cord as a suspension system is fine – if you want to add a little protection to the tree’s bark you can always place some finger thick twigs under your rope. You never tie the hammock straight to a tree. You will never get the rope untied again. There is a special way. You pass the rope around the tree, then around the line going back to the hammock, then around the tree again, repeat about three times, then secure it loosely with a running hitch which comes undone when you pull the end. The friction against the tree ensures the rope does not tighten on itself. I have slept out in a hammock in the most awful thunderstorms where the night was lit like day for hours at a time and bolts were falling all around me so close there was no thunder delay. (You can hear an audible click a second before the lightning strikes if it is very near – I have heard this many times, but you do not want to!. I felt perfectly safe as the electricity could not pass through me in the hammock to the ground, but must pass down the tree/s. The translucent cuben tarp is great for such pyrotechnic displays! I have been out in torrential rain when people in tents were flooded, soaked, yet I slumbered dry – even with just a 7′ x 7′ tarp! And in awesome winds. 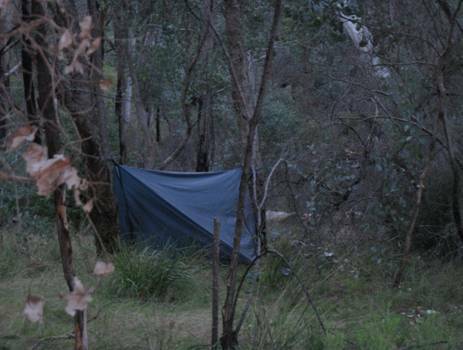 I have slept in my hammock with four inches of water streaming underneath. One advantage of a hammock is that you need no level spot; only two suitably sized trees (approx 6” diameter) about the right distance (approx 12’) apart, so they are great for camping out eg in Fiordland where it is all ups and downs and lots of trees, and unbelievably wet. There I sometimes pitch it and the tarp for lunch. Two can sit convivially side by side and break their fast, even boil the billy under the tarp! You can even both lie back and have a siesta! It is also possible to pitch one hammock above another under the same tarp. This is a lot easier if one is much smaller and lighter (as Della) whom I can boost into her hammock before I go to bed. There is a better way: you can hang them side by side. Usually we just make our own from some 2oz/yd2 ripstop eg from Spotlight which Della double or triple hems, then thread the suspension rope through the hems and tie off. This material is 60” wide which is comfy. The hammock needs to be about 2’ longer than you are. You need about 12’ of 3+mm spectra ‘rope’ on each end. These home-made hammocks weigh about 350 grams including rope, but last well. My Nano hammock weighs less than 200 grams including suspension ropes. My cuben tarp weighs about the same. If you don’t sew, you can simply tie an overhand knot at each end of the fabric itself and tie the suspension ropes on the inner side of the knot. It WILL not come undone. You can make your own cuben tarp without sewing also as (eg) zpacks have stick on tie-outs and cuben tape for joining etc. I have now discovered the wonderful Hummingbird range of hammocks and tarps which I heartily recommend. 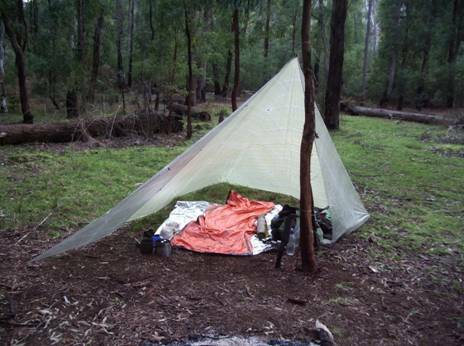 8′ x 8′ cuben tarp with wings can be pitched as a ‘fire’ shelter (as shown) or used as a hammock tarp (one end closed as storm shelter) 200 grams Hernes Spur Wonnangatta River 2011-11-18.